July’s Shake of the Month is the Ruby Dooby Birthday Cake Shake! This special shake is made with Ruby’s creamy vanilla ice cream blended with the delicious taste of cake batter and colorful rainbow sprinkles. It’s topped with whipped cream, a cherry and birthday sprinkles for more fun! This birthday cake in a shake was created in celebration of the real Ruby’s birthday month. Did you know Ruby’s Diner was named after a real Ruby? Read all about her story here. The Ruby Dooby Birthday Cake Shake be available from July 1st, 2018 – July 31th, 2018 at participating locations. 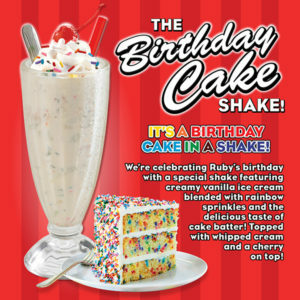 Please give your local Ruby’s Diner a call to see if The Ruby Dooby Birthday Cake Shake is available near you! The Shake of the Month limited time offer excludes casino, airport, sporting venue & food court locations. To see a list of all of Ruby’s Diner locations, please click here.